Bring Star Wars inspired inventions to life with the Star Wars Lego Mindstorms Robotics Developer kit. We will start with a simple droid mechanism, and then move on to more ambitious droids that move and walk. This modular building system lets students build using subassemblies, making it easy to create and customize the robotic droids. All these great robotic inventions are powered by the Micro Scout, the smallest LEGO microcomputer, equipped with light sensor, and 6 robotic programs to control our droid creations. 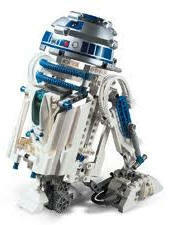 Possible Models include: Droid Vehicle, Trainer Droids, our version of R2D2 and more! We will experiment with robotic programs that avoid light, seek light, and are controlled by lights, act as alarms and more.